Water is indispensable in cooking. It is used in almost every stage; from washing the ingredients, to preparation (steaming, boiling, baking and dissolving sugar/salt… etc), to cleaning the utensils and plates once the meal is over. Is cooking with filtered water better than cooking with a different type of water? The answer is: Yes. Let’s start with explaining the differences between the main types of water. Hard water contains a high amount of dissolved minerals like calcium and magnesium. Not only is it the main reason behind your ruined glassware and dried out hair, it also can change the taste, smell and color of the food and beverages you prepare at home. Though hard water might not be a direct hazard to our health, it does contain contaminants that can be harmful to your family’s well-being and appliances’ performance. Soft water, on the other hand, has much less minerals. Water goes through a water softening process which removes dissolved minerals and impurities through ion exchange resin filters. The ion exchange removes minerals and impurities that cannot be taken out by other filters, and then resin beads with sodium ions attract dissolved calcium and magnesium. 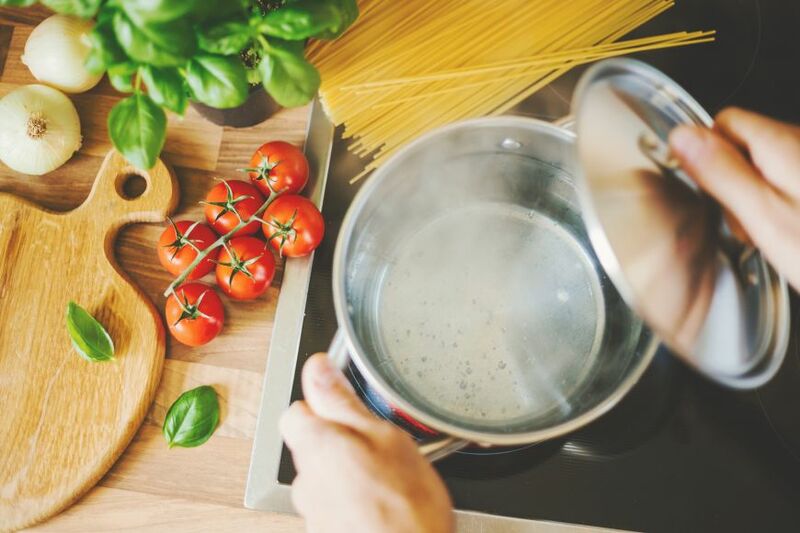 In cooking, one of the reasons soft water is preferable is because it possesses greater solvent power and therefore can carry out flavors more effectively. What is Reverse Osmosis Water? And why is it great to cook with? Reverse osmosis is one of the most advanced filtration methods where water goes through a series of filtration and purification stages. First is the sequential prefiltration stages used to remove impurities like salt, sand and sediments and contaminants like chlorine and mercury. Next, the pressurized water goes through a semipermeable membrane used to trap the smallest impurities, allowing only water to pass through (this is the reverse osmosis stage). And finally, contaminants are flushed out while the pure water is stored in a storage tank and connected to a faucet. Right before water comes to the faucet, it is filtered one last time with an activated-carbon filter to improve the overall taste and quality of water for household use. While you can cook with hard or soft water, cooking with reverse osmosis water is excellent because it is both, softened and pure. Here’s an overlook on some of the many uses of water in cooking, and why the quality of our water used really matters. Soft filtered water is essential in baking; especially bread. Hard water is full of minerals which prevent the proteins in the bread from fully absorbing the water. Hard water can also slow down fermentation, AKA the rising process. Rice, noodles and beans do not have much flavor on their own. So, your noodles will likely smell and taste the way your water does. Also, brown rice and red beans may fade in color due to the dissolved minerals in hard/ unfiltered water. In addition to poor taste, unfiltered/hard water takes longer to boil due to the minerals dissolved in it. Water is a common ingredient shared by many popular beverages. Coffee and hot cocoa are boiled, brewed, steeped or steamed, while lemonade and juice are directly mixed with cold water. It’s necessary to think about the quality of water used as it can make a huge difference on the final taste. In fact, the flavor of such beverages can be greatly impaired by the use of hard water. Water is an important part in every recipe and while you invest time, energy and money in the cooking process, consider cooking with filtered water to guarantee the best results. Drop us a message for immediate assistance or book your FREE on-site water test TODAY!